We can’t always judge a book by its cover, but when we do, it’s more likely that we are actually guessing a publishers intention, as they surely are well aware of the stereotypes they buy into when choosing one cover over another. It’s something I discussed in the review of Elif Shafak’s Honour, a book I was put off reading initially and then tempted again when I saw the US cover. You only have to put a number of books of the same genre together side by side to witness a flash of recognition that it is a certain type of book or genre. The UK cover of Me Before You suggests to me popular, light fiction, something I generally only turn to on holiday or when unable to find my reading mojo. Otherwise my reading inclination steers me towards something that might offer a unique use of language, new words, creative metaphor, unique structure, insight into a foreign culture or hopefully, evoking that elusive transporting magical sense, something not easy to describe but utter bliss to experience. So what about the US cover? I think it suggests that readers are already familiar with the author, it’s a bold confident move to use only text. Maya Angelou’s recent autobiography that I read earlier this month Mom & Me & Mom had a similar text only cover (US version), and one can understand why she is beyond needing to lure readers through an enticing cover. Does this suggest that Jojo Moyes is more of a household name in the US perhaps? Ultimately I chose to read Me Before You in order not to read too narrowly and because I am sure there will be many people who will be interested to learn more about this much talked about gripping novel. Lou has worked in the same job for six years serving locals in a café and is more than content with her small life and daily ritual. Things change when her boss closes the café and moves away. Unable to find a suitable job she settles for a six month contract as a companion to Will, a 35-year-old quadriplegic with a number of issues since his accident almost two years previously. Lou and Will are people who paths would not normally have crossed had they not reached such turning points in their lives concurrently and the six months they spend in each other’s company will allow them both to experience something unique and life-affirming. Well almost. “Don’t you think it’s actually harder for you…to adapt, I mean? Because you’ve done all that stuff? “Are you asking me if I wish I’d never done it? It is difficult to say much about the plot without giving it away, however it is unputdownable read once started, both characters are in some way stuck and need something or someone in their lives to move them on from where they are currently. Will’s issues are clear, though he is a stubborn, somewhat arrogant patient and Lou seems only to be sticking it out because she has to work to support her parents (her Dad has lost his job), her younger sister has a young child out of wedlock and the alternative employment for Lou would have been in some kind of vile chicken factory. Meanwhile her ever distant boyfriend of six years has become obsessed with training for the Xtreme Viking triathlon and shows signs of becoming jealous of a quadriplegic. If you’ve seen the excellent French film Intouchables which was a worldwide hit in 2012, knocking the popular Amelie off its pedestal for most successful French film, and is now to be remade in Hollywood (not enough Americans saw the subtitled version, the US accountable for only $13 million of the $440 million it has made so far) then you may also enjoy Me Before You. 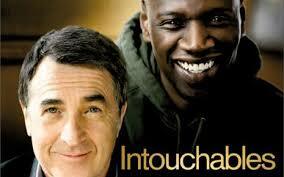 And if you haven’t seen Intouchables, based on a true story, then make sure you see it in the original French version, before it gets done over Hollywood style! It’s brilliant. Note: This book was an ARC (Advance Reader Copy) provided by the publisher via NetGalley. 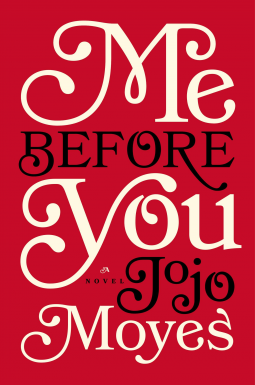 This entry was posted in Fiction and tagged book review, books, fiction, Jojo Moyes, literature, Me Before You. Bookmark the permalink. Yes, do keep an eye out for the film, very touching and funny. Firstly, great post! I really liked your discussion on bookcovers. I know they say you can’t judge a book by the cover but I think that these days you can a lot more than in the past. And now I know what ARC stands for, thank you! I’m learning even more from the comments about the difference in covers, for me visual cues are important and I am always astounded at how plain the book covers are for French books, literally a cream cover with text, you have to know what you are looking for clearly! Yes, ARC’s – you should be joining NetGalley Rowena! 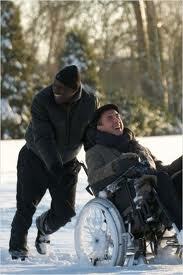 Hope you find time to see Intouchables, I think you’ll enjoy it too. Yes! I have 2 books from France (L’Elegance de Herrison is one of them) with extremely plain covers, I was quite surprised. I downloaded the sample and was immediately attracted to the characters. Like you, I’m not usually drawn to this kind of read. I’m reading something else right now but have earmarked it to read next. I keep thinking about those two characters which is a good sign. Yes, there’s definitely something compelling about these two characters, the author makes you really want to know what is going to happen to them. I saw the original Intouchables. Brilliant film! Indeed, one to watch again, I saw it in the original French without subtitles, must watch it again. Do did your ARC have the American cover? I remember browsing n Barnes and Noble on my first day in New York and feeling vaguely surprised that I didn’t already have an armful of books, then realising that it was because most of the covers were so different in style to what I’m used to that I wasn’t getting those immediate signals of ‘This is something you might be interested in’. I agree about Me Before You, it’s a completely compelling read and thought provoking too. We all loved Intouchables too – I’d urge everyone to see the French version. Interesting discussion of book covers. 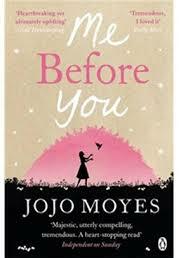 For “Me Before You,” I much prefer the UK cover; I would dismiss the book if I only saw the American one. A friend of mine last year had a book published first in the U.S. and then in England, and not only were the covers different, but also the titles — but they both worked well. And if this were a blog about films, we could talk about how English-language film titles are translated into French. You got me with ‘unputdownable’ . . .;-) Maybe I’ll be lucky and win a copy. Re: the different book cover(s) — it’s a curious thing. A book I recently read and wrote about (‘The Imposter Bride’) apparently has a different cover in its Canadian edition. Go figure. Now I have to see the French version of The Intouchables! I prefer the UK cover. Interesting contrast. Wonderful review, Claire! I loved this sentence from your review – “my reading inclination steers me towards something that might offer a unique use of language, new words, creative metaphor, unique structure, insight into a foreign culture or hopefully, evoking that elusive transporting magical sense, something not easy to describe but utter bliss to experience” – it so beautiful and pure bliss! The US cover of Jojo Moyes’ book reminds me of the cover of the edition of John Connolly’s ‘The Book of Lost Things’ that I have. I have the UK edition of Jojo Moyes’ book. I haven’t read the book yet. So thanks a lot for the spoiler-free review 🙂 Thanks for telling us about the French movie ‘Intouchables’. It is amazing to know that it has displaced ‘Amelie’ from the top of the box office hits. I loved ‘Amelie’. I will search for the DVD of ‘Intouchables’. REALLY interesting point about the covers, Claire. I’m always amazed by the (often) large differences between US and UK covers. Since I buy so many of my English books here in Italy, they’re generally the UK covers. then when I’m back in the US in a bookstore, I’m so surprised to see a cover that conveys a completely different type of book. Interesting. No, I haven’t seen the Intouchables … but it was very popular in Italy, too. Look forward to seeing it. The title and the cover bear little relation to the content I’d have to say. I read it on the kindle, I think the UK cover is misleading, it’s a serious subject, but the cover perhaps relates to her previous type of books? Not sure.